Coco or coir is the outside layer of coconut husks (or mesocarp) which consists mainly of coarse fibres but also finer material known as `coir dust’. Harvested coconuts are first soaked in water, a process termed `retting’ which makes the fibre easier to remove. 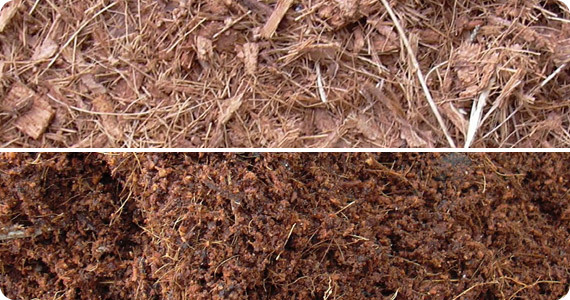 Usually the longer coarser fibres are removed for other uses while the coir pith then undergoes further processing and decomposition which makes it more suitable as a plant growth medium. Coir pith consists of a mixture of shorter fibres and corklike particles ranging in size from granules to fine dust. to suit the plants being produced. Coco was initially seen as a replacement for peat in greenhouse production – coco does not have the water repellence of dry peat, or the low pH values. However in the early days of experimentation with coco growing substrates many problems were found due to inconsistency of the product. Many coconut sources were retted in seawater and contaminated with very high levels of sodium and unpredictable levels of naturally occurring potassium. Often piles of coir dust were not left to decompose sufficiently and the resulting coco had a high nitrogen draw down index, this meant that under soilless cultivation, even with well balanced nutrients, nitrogen deficiencies in the early stages of growth were common. Coco substrates also had a high cation exchange capacity and retained calcium, phosphate and iron meaning these became unavailable for plant uptake until the coco had been in use for some time and had fully `conditioned’. As a result many soilless growers initially experienced problems with coco they didn’t understand. Few growers understood the degree with which the coco media was affecting the composition of the nutrient solution in the root zone and the fact that the coco provided an almost ideal physical structure for plant growth was overlooked. However, high quality horticultural coco is now recognised as a superior growth media for soilless crops on both a small and commercial scale and many of the initial problems have been overcome by correct processing of the raw product and adjustment or pre treatment before packaging. High quality coco substrates on the market for soilless cropping have often been specifically processed for this use right from the point of removal from the coconuts, through to preconditioning, buffering and pre treatment. This means that nitrogen draw down is no longer a major problem, sodium contamination from retting in seawater does not occur, the naturally occurring potassium levels are adjusted and treatment with calcium and other ions is carried out before the product is packaged. Suppliers of high grade coco also carry out regular testing of their product to check for any irregularities in supply and to correct for these. However while there are excellent brands of coco on the market, there are also still poor quality supplies still being sold as a growing medium and growers need to select and only use a reputable brand, preferably one which has an accompanying `coco nutrient’ formulation designed to work with the cation exchange properties of the product. These days good quality coco has proven to be a superior growth substrate for a large number of different crops, with the advantage of being from a renewable and environmentally sound resource. 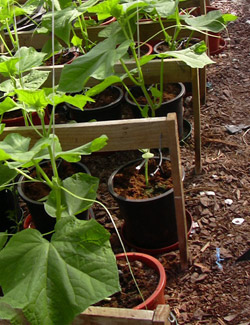 Coco propagation blocks being used to raise cucumber seedlings. There are many different types of coco products on the market. The husk of coconuts yields not only very coarse long fibres which are used to make a wide range of products such as rope, carpets, mats, brushes, basket liners and others, but between these coarse fibres is a corky substance called coir pith, coir dust, coco peat or coir peat. Many grades of horticultural coco exist and some have been specifically designed for different plants and systems. The very fine particle size of coir dust retains a high level of moisture and this is suited to seed raising and for smaller seedlings and plants. While a high moisture holding content in fine coco dust is an advantage in some situations, it can create problems with over saturation of the root zone. Grades of coco often used in slabs may consist of larger particles or `flakes’ of coco which allow a good degree of drainage and resist packing down over time as commonly occurs on substrates such as peat. Coco fibre is also the term often used to refer to the general purpose grade of coco which is ideal for growing longer term crops under soilless cultivation. Worldwide coco is used for soilless crops such as tomatoes, peppers, cucumber, melons, aubergines, ornamentals, cut flowers and many others because the structure of the coco does not break down over the time frame these longer term crops are grown for. Thus high rates of root zone aeration and moisture retention are typical in both short and long term soilless crops and this results in high yields and good root health. The optimum physical structure of coco means that crops are provided with high levels of oxygenation and moisture in the root zone. Coco also comes in a range of different products – from small to large compressed `bricks’ to `grow slabs’ to pre expanded ready to use, bagged product. Compressed bricks of coco fibre mean the cost of shipment can be kept to a minimum, a typical 5Kg block of compressed coco can be expanded in water to over 65 litres of ready to use growing substrate. Pre wrapped slabs of compressed coco can be less than one inch thick but when expanded with water within their plastic sleeve give a full sized growing slab comparable in volume to rockwool. The advantage of coco bricks is that once expanded the media can be used to fill any size or shape of growing bed, pot or bag, the disadvantage is that a time is required for the media to fully expand and some labour is needed to fill the growing plots. Loose coco placed into growing pots or containers can be easily inspected for moisture level by checking the appearance of the top of the substrate or by feeling the moisture level of the coco just below the surface, this is more difficult in wrapped coco grow slabs. The coco slab only needs to be placed in position, slits cut in the plastic sleeve and water poured in – the coco expands and can be planted out with no further effort. The disadvantage of slabs is that they need a very level surface to sit on so that drainage is even and they don’t provide the depth of growing substrate that a planter bag or pot can for larger plants. Coco is available in a range of grades from very coarse 'orchid fibre' seen here, to fine 'coco dust'. 1. Always invest in a good quality, well known brand of coco designed for soilless growing and don’t be fooled by the many inferior quality products on the market. 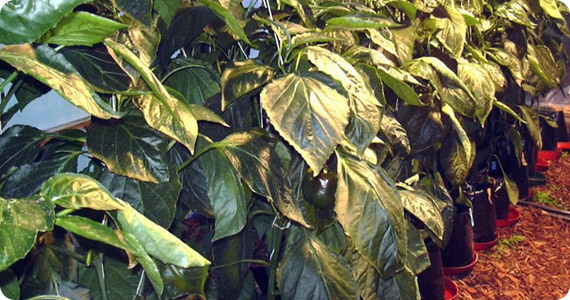 While coco from different sources may look similar, there can be large differences in the quality and this can have a negative impact on plant growth. Coco products sold in garden stores and hardware outlets often as inexpensive compressed bricks of `garden mulch’ are not usually suitable for soilless growers – these types of coco are typically high in sodium (an unwanted element), high in total salt content, often have not been fully decomposed, and hence have a high nitrogen draw down which can result in nitrogen deficiency even when the full strength nutrient solution is applied. Inferior coco products are also not `buffered’, `conditioned’ or `pre-treated’ to stabilise the potassium levels and boost calcium which is required to offset the tendency of coco to retain calcium. They may also contain weed seeds and pathogens. Buying a reputable brand of coco for soilless growing is an important investment in the nutrition and health of the plants and also simplifies the process of growing a great crop. 2. Select the right nutrient product (i.e a specific coco nutrient product) to use on coco substrates. 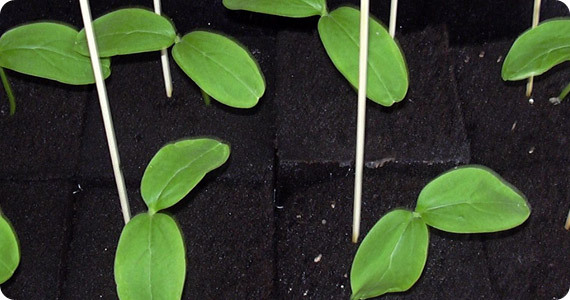 Coco growing media is not like many other soilless substrates such as rockwool which arrive pre sterilised, chemically inert with a low CEC and with a very minimal effect on the composition of the nutrient. Coco contains naturally occurring potassium which since potassium is a major plant nutrient, is considered a bonus; however this needs to be allowed for in the nutritional program of the plants. Coco also has other effects on the composition of the nutrient solution applied and levels of nitrate, phosphate, calcium, magnesium and iron may need to be adjusted to, allow for these properties. There are commercial brands of specific `coco nutrient’ formulation products on the market, however it is always a good idea to select both the coco substrate and the coco nutrient of the same brand as it is likely they have been developed to work together and will give the best results. High quality coco products are likely to have been pre-treated and the accompanying coco nutrient will take this into account so that the ratio of elements in the root zone stays as optimal as possible. grown in high quality coco. 3. Select the right type of coco product for the plants being grown. There are a large range of coco products on the market and many different grades with various horticultural uses. While orchids prefer a very coarse coco `chip’, using coco for propagation and germination of small seeds requires a much finer grade which will hold sufficient moisture as well as oxygen. General purpose coco which consists of a range of particle sizes is considered ideal for many plants and is the most widely used grade for soilless production. The coarser particles help the coco substrate remain more `open’ to aeration while the finer particles hold moisture between irrigations and the combination of both these, is what gives coco close to optimum physical structure for plant growth. 4. Remember that coco is a `living substrate’ and it should be treated as an entire eco-system which consists of beneficial microbes who make their home in the coco particles. This beneficial microbial life plays an important role in soilless systems as many fungi have a protectant effect on the plant’s root system and have been proven to suppress plant pathogens as well as other possible benefits with nutrient uptake and plant growth. While other growing substrates start out as ster best left in its original state or even inoculated with populations of beneficial microbes such as Trichoderma. These populations of beneficial microbes in coco are to be encouraged and for that reason harsh sterilising chemicals such as chlorine bleach, hydrogen peroxide and even boiling water should not be used on coco substrates at any stage. Finer grades of coco can be used to germinate seeds and raise seedlings. 5. 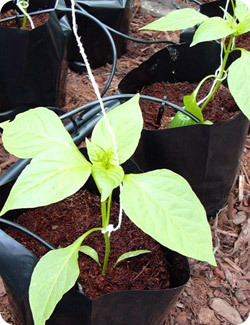 Coco usually maintains pH within an optimal range; however EC can build over time and should be checked from time to time, particularly under warm growing conditions where the plant may have been taking up a lot of water from the substrate, allowing the concentration of nutrients to climb. Because of the nature of coco growing media the EC around the plant’s roots may be different to that in the leachate or the solution draining from the growing slabs, pots or bags. A quick and simple `extraction sample EC test’ can be carried out on coco media to determine the actual EC around the root zone. For an extraction test, a small sample of coco is taken from the growing media, (several samples should be taken and combined to give a representative sample). Then 100ml of these combined samples is measured out (coco should be damp but not overly saturated). The 100ml sample of coco is placed in a jar and 150ml of deionised (or RO) water is added and the mixture shaken 50 times. This is allowed to sit overnight to allow extraction of nutrient ions in to the water. The resulting mix is then re shaken and filtered to remove particles and the pH and EC can be measured. The ideal pH range for the extract for most crops is between 5.5 – 6.2. Ideal EC levels vary depending on the stage of plant development, the growing environment and the crop being grown, however a general range is between EC 1.0 and 2.5 (tomatoes may be grown at much higher EC values, particularly with commercial crops). Larger scale growers and those in commercial production will often have the coco extract sent of to a lab for a complete nutrient analysis which determines the levels and ratios of each of the elements in the nutrient solution so that fine tuning adjustments can be made. 6. While coco is a great growing substrate it still needs to be monitored and just as with other substrates, it is possible to over water and saturate the root zone. Coco can look slightly dry on the surface and still be fully moist in the root zone, so checking the moisture a few inches below the surface is recommended. 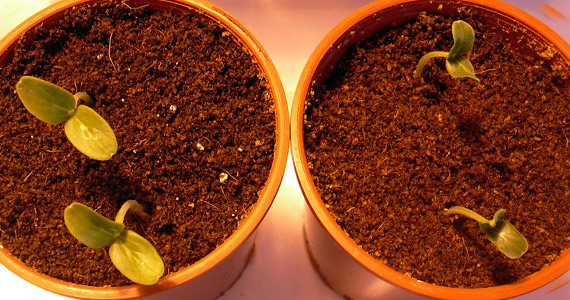 Moisture should be present when the coco is squeezed between the fingers but the surface of the growing media should not appear to be wet - over damp coco can also attract fungus gnats as well as reducing the level of oxygenation in the root zone. 7. Coco is an environmentally friendly substrate and a fully renewable resource which can be used for more than one crop. However once its usable life is over it still makes a valuable soil mulch or soil conditioner for outdoor plants, and can be added to vermiculture (worm farm) and compost systems. Noguera P, Abad M, Puchadea R, Noguera V, Maquiera A and Martinex J, 1907. Physical and chemical properties of coir waste and their relation to plant growth. Acta Hort. 450: 365-373. Prasad M, 1997. Physical and chemical properties of coir dust. Acta Hort 450: 21-29.